Experience Matters. For more than 40 years, we have been manufacturing custom graphic overlays, appliques, and pressure sensitive products, earning us a reputation for dependability, quality and innovation. Our applications have become relevant within many industries across the globe, but most prominently in Medical, Industrial, Appliance, Computer and Electronics and Automotive. We are committed to serving customers in these industries by investing in leading edge-technology and expanding our range of knowledge and capabilities. 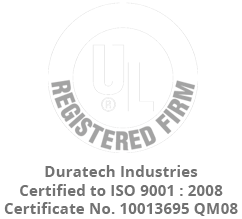 Our ISO certification and UL and CSA registrations serve as a testament to our knowledge; ensuring compliance to the various guidelines and regulations required of these industries. Manufactures of dishwashers, ranges, refrigeration, laundry, and small kitchen appliances have enlisted our help to create custom decorative solutions including In- Mold Electronics (IME). Duratech’s In-Mold Decorated applications with backlit options can be used for dashboard components, buttons and indicators, center counsels, and PRNDLs. Whether it’s the need to understand adhesive properties, designing and producing your product’s touch screen, membrane switch, keypad overlay, developing custom labels, or knowing what the latest look in branding might be, we can support your technological and design needs. Heavy use and often constant exposure to extreme environments can impact your machine control panels; our industrial applications are durable, reliable and designed to function as intended. Medical is one of the fastest growing industries we serve. With manufacturing capabilities in both the USA and China, professionals in this industry have used our applications in diagnostic systems, control unit displays, surgical tools, and much more.